Things are becoming infinitely more clear that under the Obama Administration, corruption seemed to be at the very heart of things. We’ve learned a great deal since President Trump was duly elected and took the oath of office. It is beginning to make very clear sense why the Fascist Left (including the media, if not led by the media), has been out to derail the Trump Administration. We’ve seen resistance and obfuscation from the very beginning. Many people on social networks have as their battle cry “RESIST!” It is obvious that they do not want Trump to succeed. They offer the excuse that Donald Trump is an “illegitimate” president, ostensibly because Hillary won the popular vote. Questions exist though regarding the fact that there may well have been millions in illegal votes cast for Hillary. If true, it means that those votes don’t count and President Trump actually won the popular vote too. Of course, left-wing outfits like Snopes are immediately there to cast doubt on things. But Snopes has been outed as a left-wing voice politically for some time so the only people who take Snopes’ word for anything are those on the left. The cry of resistance is a vocal one that seeks to destroy Trump before he even gets going. We’re seeing the resistance in Congress with respect to Judge Neil Gorsuch. In 2006, he was unanimously confirmed to the federal bench. Not one Democrat voted against his confirmation. Now however, led by Sen. Chuck Schumer, Democrats have signaled that they will not support him, though some Democrats are breaking ranks, notably Democrats who are running for re-election in 2018 in states where Trump overwhelmingly won. As things have progressed, more has come to light. We are all familiar with Trump’s claim that he was wiretapped by the Obama administration. Of course, as was expected, the leftist machine went into overdrive attempting to throw a tremendous amount of confusion into the array. They mainly did this (and continue to do this), by vociferously claiming there was collusion between Donald Trump and people in his transition team with Russia. This has been the claim by people in the media as well as within Congress. It is the go-to point they harp on yet to date, not one shred of evidence has come out. The Left remains resolute however, in believing (or wanting us to believe that they believe), that there was collusion and that Russia worked with Trump to help get him elected. What has become clear from this is the issue of wiretapping. Against Trump’s original claim that the Obama Administration wiretapped him, more evidence has come to light that proves Trump correct in his assertion. This is in spite of the fact that the Left did everything they could to downplay and deny any wiretapping took place. Over time, their story has had to change to keep up with newly discovered evidence. 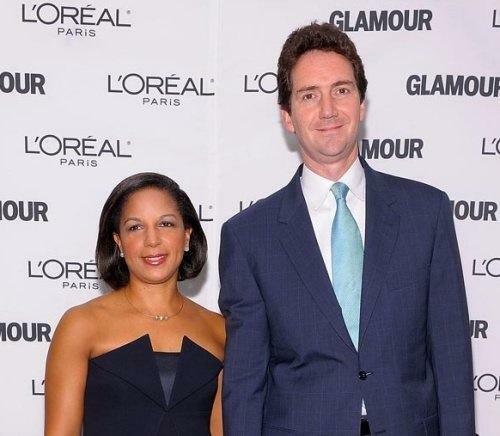 Probably the most damaging so far is the fact that Susan Rice appears to be the person who “unmasked” the names of individuals within the Trump transition team. Originally, the claims were that any wiretapping of Trump was done as part of “incidental collection.” This means that while the spy agencies of America were busy surveilling things, they “accidentally” gathered data from Trump and associates. It all meant nothing, intoned the Left. 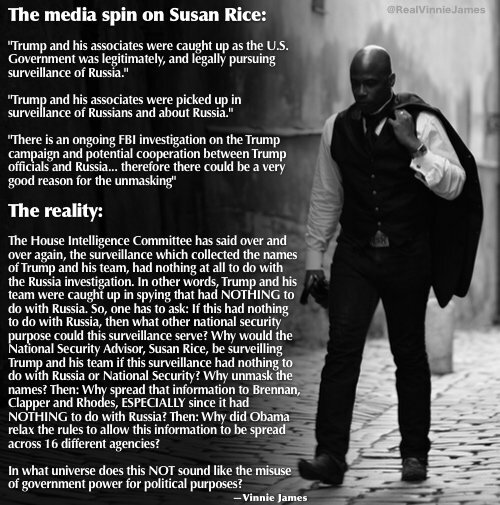 The problem though goes well beyond simply “incidental collection.” As we’ve learned, Rice went beyond this to “unmask” the names of individuals connected with the Trump Administration. This is how Flynn was ousted. Was there an actual reason for unmasking Flynn and possibly others? Aside from the current claim that Susan Rice was simply “doing her job,” no evidence has been presented that anything Flynn or others in the Trump Administration discussed was a problem for national security at all. We can be assured that had this been the case, that information would have been leaked and it would have been leaked LONG before the November 2016 presidential election. In essence, it was designed to give Hillary the victory. But aside from “unmasking” names (which tends to prove that even if there was “incidental collection” of information, it turned from that to intentional spying on a candidate for political office), Susan Rice apparently demanded that all phone calls of Trump and his people should be preserved into spreadsheet format for easy reference. Unfortunately for Susan Rice, it appears there was absolutely no probably cause. Honestly though, I have no faith in congressional hearings. We’ve seen too many of them in recent years where nothing happens except a great deal of huffing, puffing, and posing. Lois Lerner? James Clapper? James Comey? Hillary Clinton? IRS Commissioner John Koskinen, and many others are well-versed at lying and they do it with a straight face because it is their native tongue. Subterfuge, obfuscation, and outright lies are what these folks do and yet in spite of that, has anything happened to any of them? Instead of going before Congress and being allowed to plead the 5th, these people should be arrested (if it is believed they’ve actually committed crimes), and let the justice system sort things out. Congress does nothing except put on another daytime reality TV show at great expense to the taxpayers. It’s a sham and no matter how good the intentions of some in Congress are, this type of dog and pony show has been going on in Congress since the 1930’s. Apart from Nixon having to resign, has anything else ever happened? Bill Clinton was impeached for lying to Congress yet there were not enough votes to actually remove him from office after he was impeached. But isn’t lying to Congress a punishable offense? Absolutely. It is punishable via fines and/or imprisonment of not more than five years. Ostensibly then, Bill Clinton, Lois Lerner, James Clapper et al could have seen the inside of prison walls, but did not. 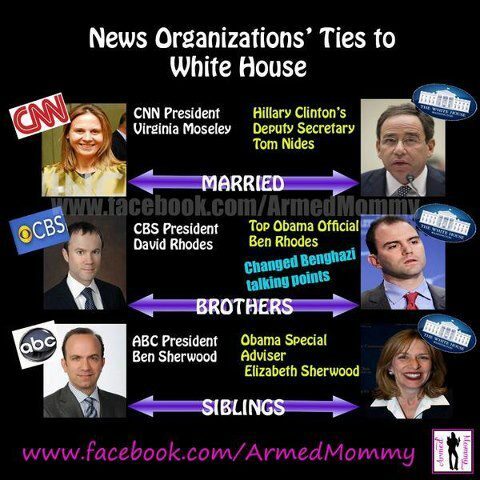 Media connections to Obama Administration via nepotism. The corruption that is being revealed from members of Congress, members of the Obama Administration, and members of the media is astounding. Yet, with each new release of factual data, these individuals merely double down, refusing to acknowledge any issues or problems. They change the narrative slightly to accommodate the newly discovered damnable evidence and continue on their merry way obfuscating, lying, and resisting. It makes sense that the media would be as involved in the cover-up and collusion as possible given the fact that many in the Obama Administration are married to people high up in the media. This should not have existed and the fact that it did tends to offer proof that the media colluded. Donald Trump said he was going to drain the swamp in DC. Clearly, the swamp is fighting back, unwilling to go down without a fight. It’s becoming clear that the swamp includes much of the media that spins, lies, obfuscates, and protects Barack Obama and his underlings as they’ve done much in their attempts to destroy America. Just yesterday I read an article where President Trump has indicated the nuclear deal that Obama made with Iran is absolutely terrible. Americans still are not aware of the facts of the agreement and Iran has recently stated that it won’t end well if President Trump reveals the details of that agreement. Something is very strange. Why can’t Americans know the deal that President Obama made with a rogue nation dedicated to Israel’s destruction as well as America’s? In reality, the deal that Obama made very likely gave Iran the ability to develop nuclear weapons and which country do you think they will be used on first? If you said Israel, you’d be correct. We can expect the fight by the swamp to continue and more and more that’s coming out proves how corrupt the Obama Administration and the swamp of DC has been and remains. They are fighting for their collective lives and losing their grip. One can only hope and pray for President Trump’s safety and continued fight against a thoroughly corrupt system that’s been in place for quite some time. Entry filed under: 9/11, Agenda 21, alienology, Atheism and religion, Barack Hussein Obama, Barry Sotero, christianity, Communism, Council on Foreign Relations (CFR), Cultural Marxism, Demonic, devil worship, Emotional virtue, eternity, Global Elite, Gun Control, ISIS, Islam, Islamofascism, israel, new age movement, Political Correctness, Politically Correct, Politics, Racism, Radical Islam, Religious - Christian - End Times, Religious - Christian - Prophecy, Religious - Christian - Theology, salvation, Satanism, second coming, Shadow Government, Sharia Law, Socialism, Trilateral Commission. Tags: deep state, deep state government. Well done account of the sad State of our Union or more correctly our disunion. Christians must wear divine hip boots to wade through the muck of our totally depraved pols in our D.C. Swamp, or literally a pork sty under conditions much like prevailed in Canaan or Nineveh before their destruction by divine decree or of Rome by Teutonic savages…..in our case by domestic Obama loyalists and imported terrorists. Thanks be to God for the imminent Rapture of the “few” of us, in Jesus’ words, who will escape the further escalation of violence in the succeeding Tribulation period under the ruthless global anti-Christ.